Dubai – April 3, 2019 (Gulf Intelligence): China’s GDP rates will not decline in the near term towards levels more typical of OECD countries of around 3%, according to more than two thirds (69%) of those polled in GIQ’s monthly Energy Market Survey in March. 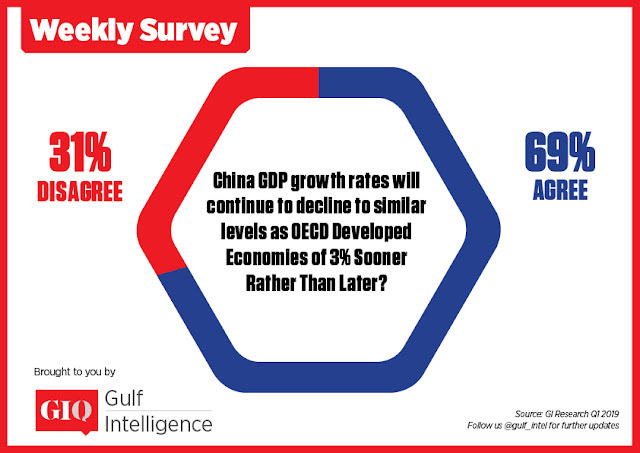 China’s GDP has halved in the past decade from 12%. Earlier this year, China confirmed that it had registered the slowest growth in 2018 for the last 30 years – with GDP at 6.6%. Forecasts for growth this year are around 6-6.5%. As Asia’s largest consumer of cars, electronics, and energy, the impact on global growth is expected to take its toll. At the start of the year, the IMF for the second time in three months revised its growth forecasts for the global economy on the back of the Chinese growth outlook, forecasting 3.5% for 2019 and 3.6% next year. But despite this, oil prices have held steady in the first quarter in the $60s/barrel range for Brent, mainly on the back of strong compliance by the OPEC+ group of producers to cut output by 1.2m b/d for the first six months of this year. Survey Q1: OPEC+ JMCC bimonthly meeting in Baku on March 17-18 will report 100% compliance with current oil output cuts of 1.2 million barrels a day? 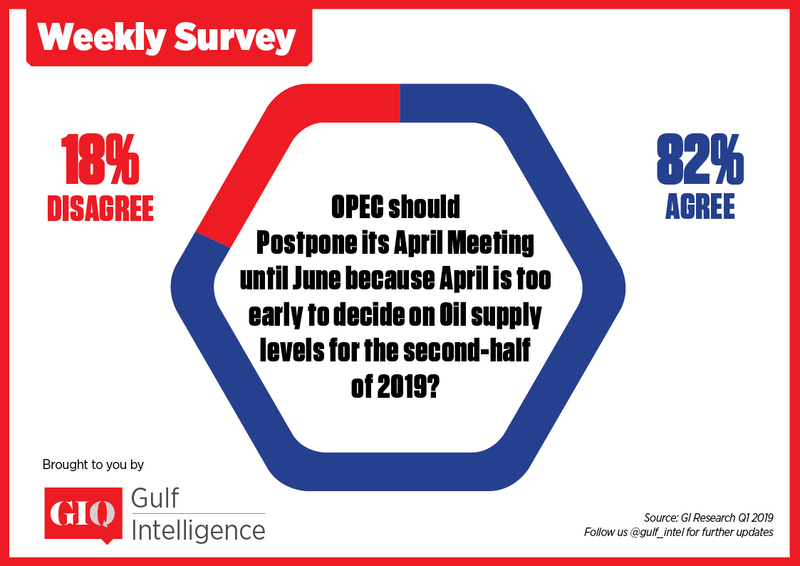 Survey Q2: OPEC should postpone its April meeting until June because April is too early to decide on oil supply levels for the second-half of 2019? On the geopolitical front, 68% of the GIQ survey audience believe that the mechanism by which the UK eventually leaves Europe will impact the direction of oil prices this year. The inconclusive nature of the BREXIT process as of March 31 seems to have had no impact thus far on prices. Survey Q4: Will a HARD BREXIT or a SOFT BREXIT make any difference to the trajectory of oil prices in 2019? Meanwhile, on the other side of the pond in the US, Robert Mueller’s Special Council investigation found there had been no collusion between US President Donald Trump and Russia in the 2016 US elections. Only 37% of participants in the GIQ survey felt that the report’s conclusions would have an impact on economic growth and oil demand. 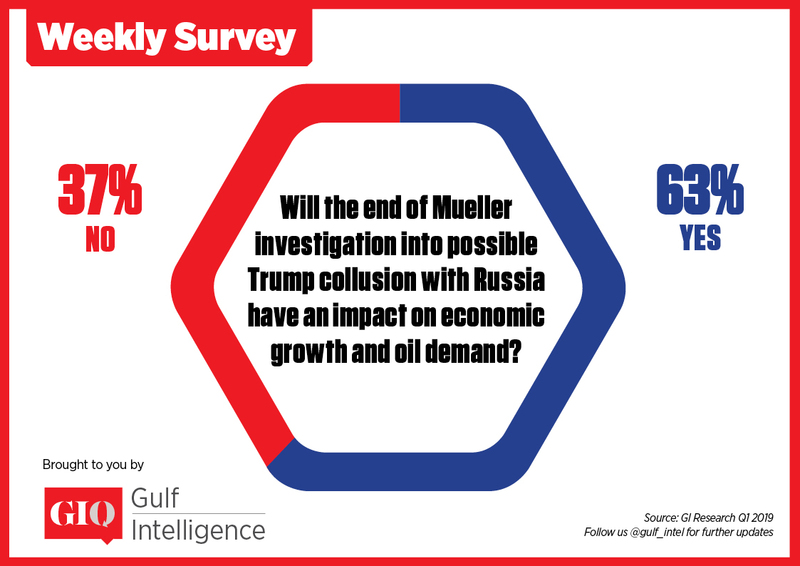 Survey Q3: Will the end of Mueller investigation into possible Trump collusion with Russia have an impact on economic growth and oil demand?